I LOVE trying new food products! It takes me forever to finish my weekly grocery shopping because I always stop to look at (and sometimes buy) what’s new. That’s why I’m super excited to be able to share some of my new favorites that not only taste good but pack a nutritional punch. Since March is National Nutrition Month, it’s the perfect time to refresh your eating habits with products you can feel great about! I was just having a discussion with my daughter the other day about how we could eat rice every day and never get tired of it. She cooks hers in bulk, but I cook mine fresh with every meal. I don’t really mind, but when I only need one or two servings, it seems like a hassle. 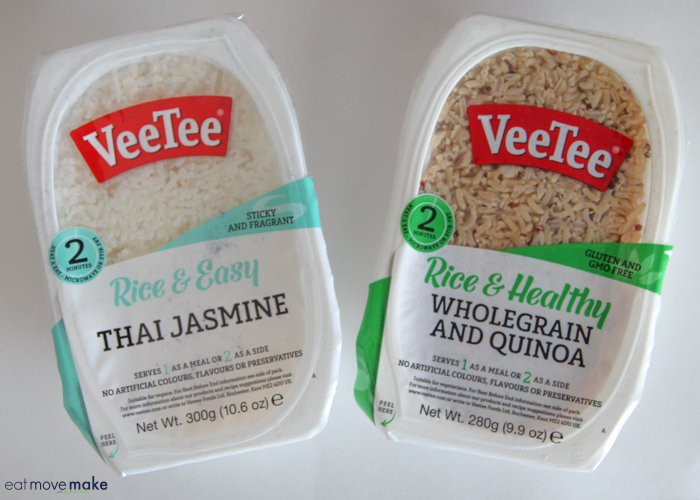 Enter VeeTee Thai Jasmine Rice and VeeTee Wholegrain Brown Rice & Quinoa. 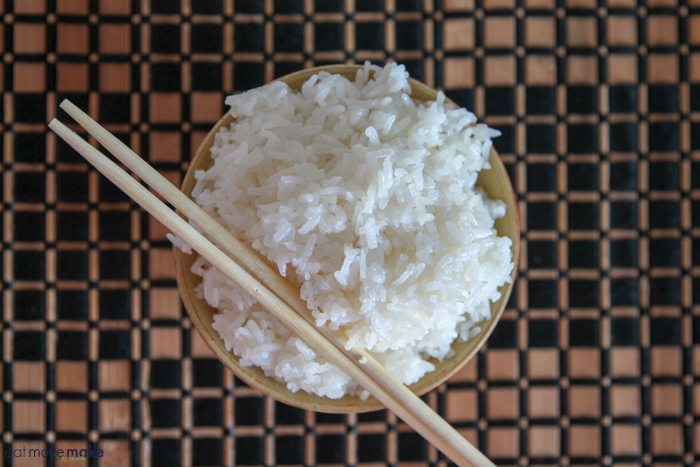 The Thai Jasmine Rice is my favorite with a delicate aroma and just the perfect amount of authentic stickiness for soaking up a sauce. The sticky texture makes it super chopstick-friendly. Peeling off the lid, microwaving for 2 minutes means cooking quality white rice has never been easier. VeeTee’s Wholegrain Brown Rice & Quinoa is an easy way to add protein-rich quinoa grain into your diet. It makes a great side dish, and I love adding it to salads or leftover chilis or soups. The nutty, slightly sticky texture has all the goodness of brown rice but is microwaveable in 2 minutes! By the way, there are no artificial flavorings, colors or preservatives and they’re gluten-free, vegan and Non-GMO verified. Click for more info on VeeTee. If you haven’t tried kombucha yet, do it! It’s a fizzy, delicious gut-nourishing drink in three fruit-forward flavors: Ginger Peach, Tropical Mango and Apple Mint! 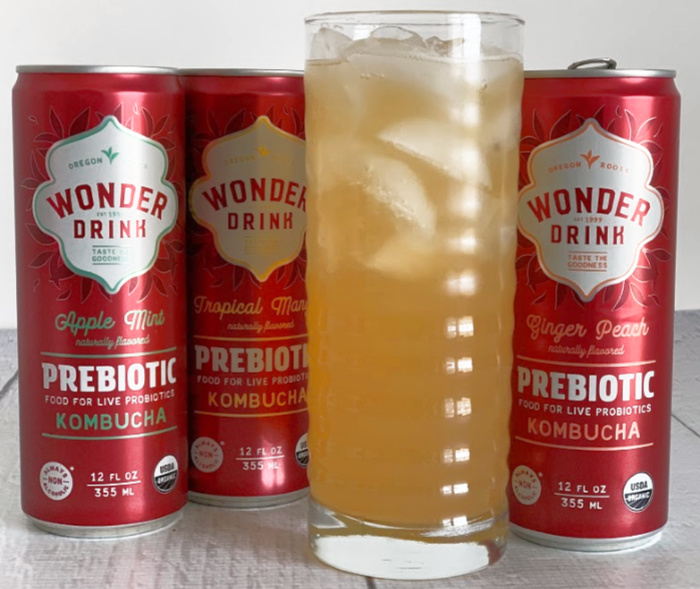 The new Wonder Drink Prebiotic Kombucha is the first and only kombucha with Xylo-oligosaccharides, a plant-based, organic prebiotic fiber. XOS Fiber (Xylo) is shown to selectively nourish naturally occurring probiotic bacteria in the gut. The 12-ounce cans contain only 10g of sugar and are certified organic, guaranteed non-alcoholic, Non-GMO, veg and gluten-free. March Special: Save $4 with this coupon at Amazon. 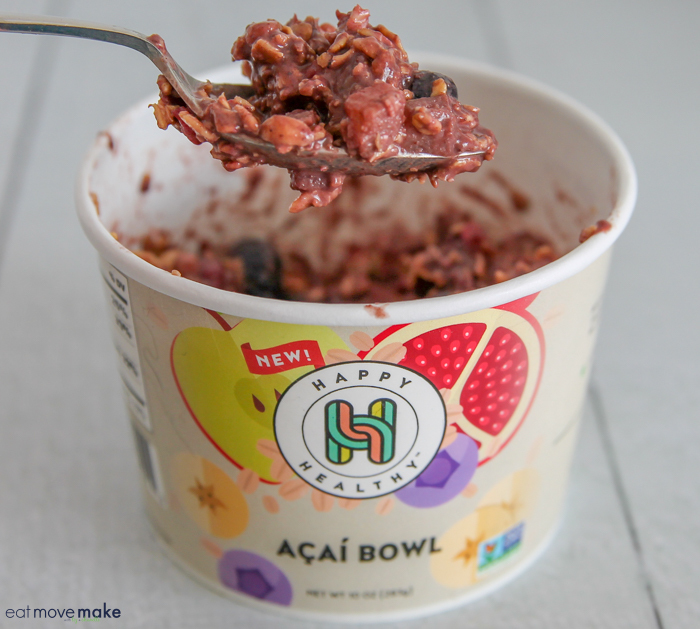 Breakfast has never been easier with the new overnight oats, smoothies and acai bowl from Happy Healthy Co. The heart-healthy açaí bowl is loaded with antioxidant goodness and the organic yumminess of açaí, oats, honey, apples, pomegranate and blueberries (and the blueberries are plump!) Just thaw, stir and enjoy. It’s a great way to detox! I let mine thaw in the fridge overnight for a delicious breakfast. It’s portioned for one, but it’s a generous serving, so I almost always have some left to enjoy as a mid-morning or mid-afternoon snack. The Happy Healthy Co. overnight oats are also terrific for heart health and immunity and make a great addition to a weight control dietary plan. The mouthwatering flavor combos include delectable ingredients like raspberries, oats, blueberries, dragon fruit, banana puree, peaches, pineapples, chia seeds, pumpkin puree and raisins. Before bed, add water or your favorite kind of milk to the container and pop it in the fridge. In the morning, the overnight oats can be eaten hot or cold, but since I like how soothing it tastes when heated, I always warm them up. 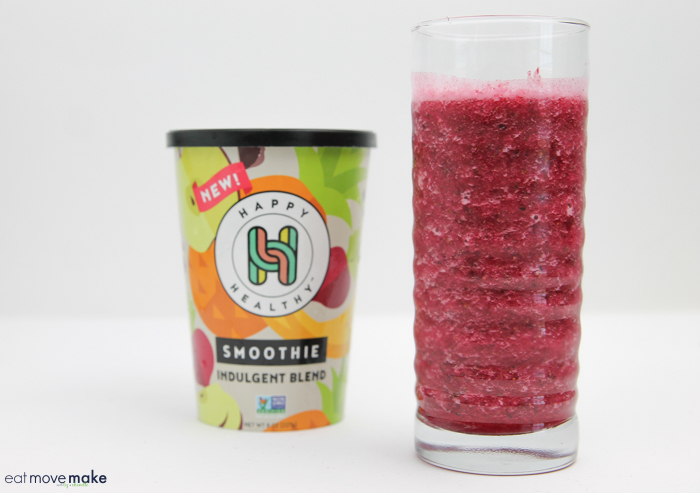 Another nutritious option to boost heart health and brain health is the Happy Healthy Co. smoothie. The easy to make pre-portioned healthy smoothies are rich in antioxidants. Add water or milk, blend and sip, sip, sip! They’re great for on-the-go since they have lids. Just pop in an eco-friendly straw and enjoy one of the 5 delicious flavor combos using green tea, apple, spinach, mango, pineapple, coconut, mint, spinach, beets, cacao nibs, banana, carrots, dates, sweet potato, chia seeds, blueberries, cucumbers, honeydew melon, flax seed, hemp seed and more. All Happy Healthy Co. products are produced in a nut-free and vegan facility and all ingredients are non-GMO. Special Offer: Get $10 off your first order, and mix and match bundle boxes are available online and ship directly to the continental U.S.
Stir a spoonful of Nutiva Organic MCT Powder (vanilla flavor – yum!) into your morning coffee, smoothie or shake for a quick but long-lasting boost in energy, mental clarity and fat burning throughout your day. The certified organic pure MCT formula is keto-friendly and free of hexane, chemicals, GMO fillers, dairy and gluten. And try Nutiva Organic Squeezable Steam Refined Coconut Oil in place of oil or butter the next time you’re baking, stir-frying or sautéing. Since the oil has been steam-refined, it doesn’t have coconut flavor and since I hate coconut, I’m thrilled to finally be able to use coconut oil. 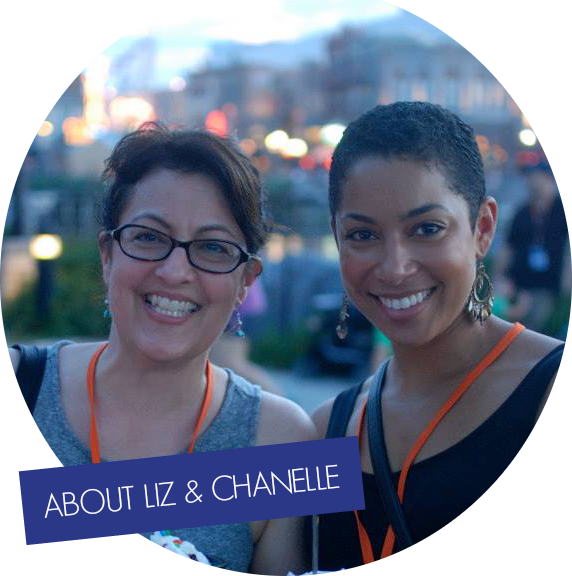 Plus, I love the squeeze pouch! Both Nutiva products are keto-friendly and vegan, certified organic and non-GMO. 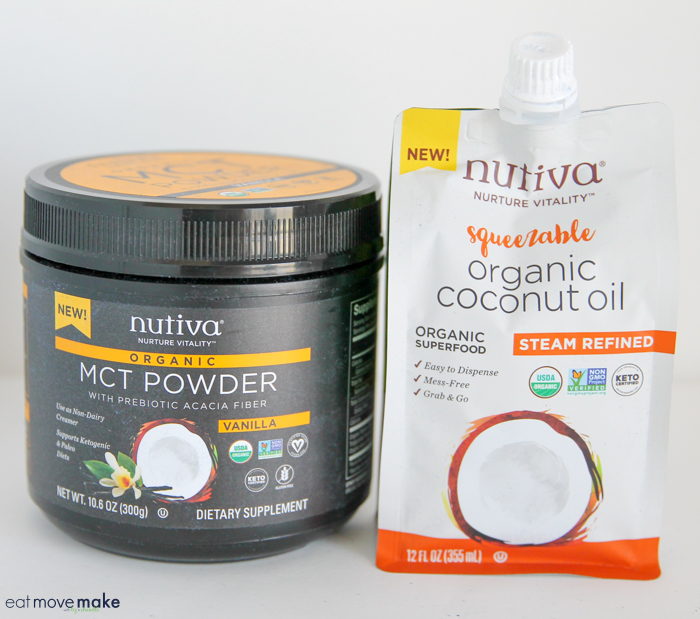 Special Offer: Use the code NUTIVA25 for 25% of All MCT Powder flavors + Refined/Virgin Coconut Oil Pouches between 3/1/19-5/31/19. One offer and one use per customer. Start your day with a creamer with benefits. 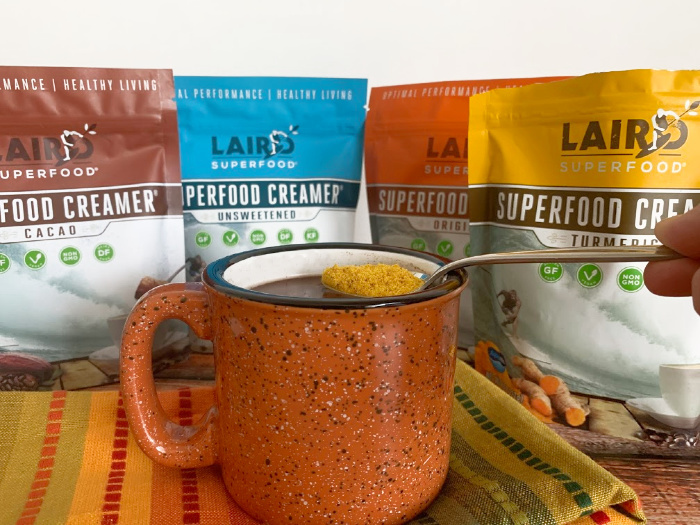 Laird Superfood creamers add functional ingredients to your morning cup of coffee, tea or smoothie for a crash-proof energy boost. Laird Superfood uses all-natural, whole food ingredients – nothing artificial, and they work with just about any diet or values-based meal plan. Since I’ve been hearing so much about the benefits of turmeric lately, that’s my daily go-to at the moment, be it in my hot tea or in my gluten-free and vegan baked treats! Special Offer: Save 20% on your first Lairdsuperfood.com order with code BABBLE20 now through June 1, 2019. All of these goodies pack a nutritional punch and taste delicious at the same time! 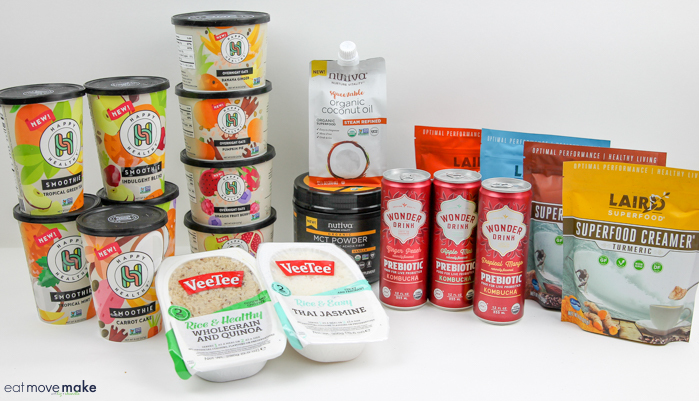 Which new food products will you try first? These things are great! I’d love to have them around my house. My youngest Isaak has gotten sick with colds so much this year. I should get some to up his immune system. Happy to know that there are healthy easy to prepare food like this in the market. I just can’t wait to buy some and stock up! I am always looking for new food ideas. And it’s better when they are healthy! These are all delicious and nutritious foods! I love the fiz of kombucha! It is so healthy and refreshing when flavored right. These all look awesome. Great healthy meals that are quick to prepare are good in my book. My most favorite from the list is Kombucha! I love this drink, as it adds so many health benefits to our living. These all look so great! I love healthy food that makes me think I’m eating UNhealthy food. LOL I have to try these.